CHICAGO — If U.S. voters side with the majority of vended laundry owners who responded to this month’s American Coin-Op Your Views survey, Donald Trump will be elected president of the United States in November. Roughly 67% of vended laundry owners polled in the anonymous, unscientific survey say they are supporting the Republican ticket of Trump and running mate Mike Pence. Roughly 19% are supporting Democrats Hillary Clinton and Tim Kaine, and 1.9% favor the Libertarian ticket of Gary Johnson and Bill Weld. Approximately 8% of respondents aren’t sure who they will vote for, and 3.9% say they will not be voting. 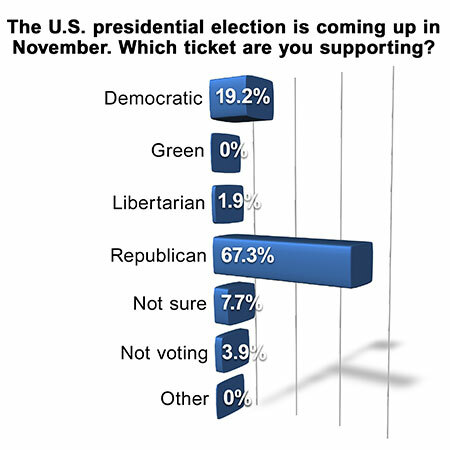 No survey-taker favors the Green Party ticket or a party other than those previously identified. The state of the U.S. economy will be most influential in helping 43.1% of store owners decide how to cast their vote. Next, at 25.5%, is homeland security. Other issues set to influence respondents are gun control (7.8%), immigration (3.9%) and healthcare (2.0%). No one taking the survey sees the environment as the issue that will most influence their vote. Nearly 18% of respondents say “other” issues will be most influential. In most cases, respondents say all of these issues are equally important. Supreme Court appointments, religious freedom, and federal spending were also singled out. Despite the interest in this year’s presidential race, the majority of respondents don’t believe that election and its result influences their small business as much as other elections. 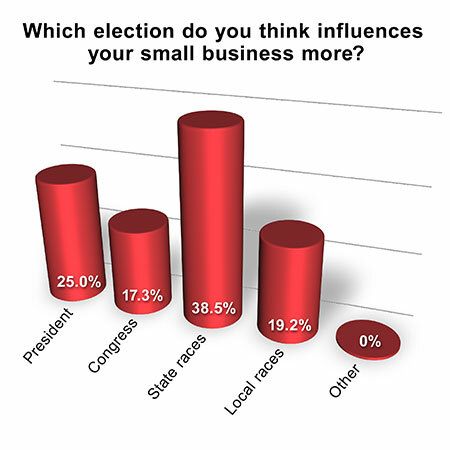 Roughly 39% say state races most influence their business. One-quarter of respondents say it’s the presidential election, 19.2% point to local races, and 17.3% say Congressional races are most influential on their operation. While American Coin-Op’s Your Views survey presents a snapshot of store owners’ viewpoints at a particular moment, it should not be considered scientific. Qualified subscribers to American Coin-Op e-mail blasts are invited to participate anonymously in the quarterly industry survey.